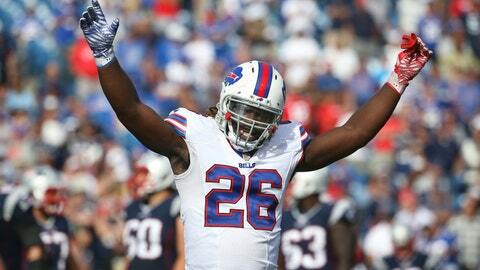 Boobie Dixon of the Buffalo Bills has become the featured back with his teammates out with injury. The Buffalo Bills are battling two opponents this weekend. First, the Tennessee Titans Sunday in Nashville, Tennessee, and the second are injuries to key offensive personnel. The Giants’ game last week was an example of how important it is for the Bills to become healthy again in order to compete for a playoff spot. RB LeSean McCoy has yet to turn the corner with the nagging hamstring strain that occurred 8 weeks ago, and his production has shown he is not himself. McCoy has lacked the agility and quickness that has made him one of the NFL’s most feared running backs. “Shady” is averaging just 3.4 yards-per-carry through the first three games of the season and after re-aggravating the injury, will sit out of games until he reaches 100% health. The absence of McCoy is a tremendous blow to Greg Roman’s offensive scheme that is centered around an explosive ball carrier that also plays a large role in the passing game. To make matters worse, another running back went down. Just as rookie RB Karlos Williams began to take the NFL by storm four weeks into the season, Williams suffered a concussion vs the Giants that will have him sidelined for at least another game. Williams was carrying the offensive load with McCoy hampered by injury, but with the rookie unavailable, the rushing attack was dealt another blow. That leaves Anthony Dixon as the featured ball-carrier. Now, with all due respect, RB Anthony “Boobie” Dixon is a good player in his own right, but he does not bring the explosion and home-run threat to the Bills’ offense like McCoy or Williams can. Another player who plays a crucial role in the Bills’ offensive success is second-year WR Sammy Watkins. Now to be fair, Watkins has been double-teamed in every game he has played in, opening opportunities for TE Charles Clay and receivers Percy Harvin and Robert Woods to flourish. Great players develop this kind of attention from defenses, but great players also make plays when their number is called. His seven receptions for 99-yards and a touchdown through three games is a red flag with a player of his caliber and his latest battle with an injury, this time a calf strain, limited the Bills’ offense severely against the Giants and showed us how important Watkins is in this offense, even if it means he is used as a distraction downfield. Right now, the Buffalo Bills are just trying to survive these next few weeks until the team is complete again, and once that happens, the final stretch of the season will be one to remember. What’s wrong with Ohio State Football’s offense? Green Bay Packers: Will Aaron Rodgers throw an interception this week against the St. Louis Rams?